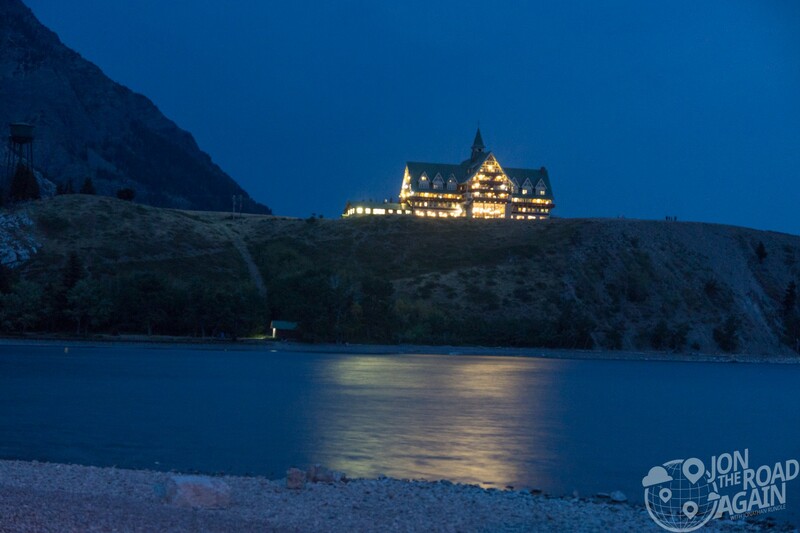 The Prince of Wales Hotel in Waterton Lakes National Park is yet another of the historic hotels of this region. 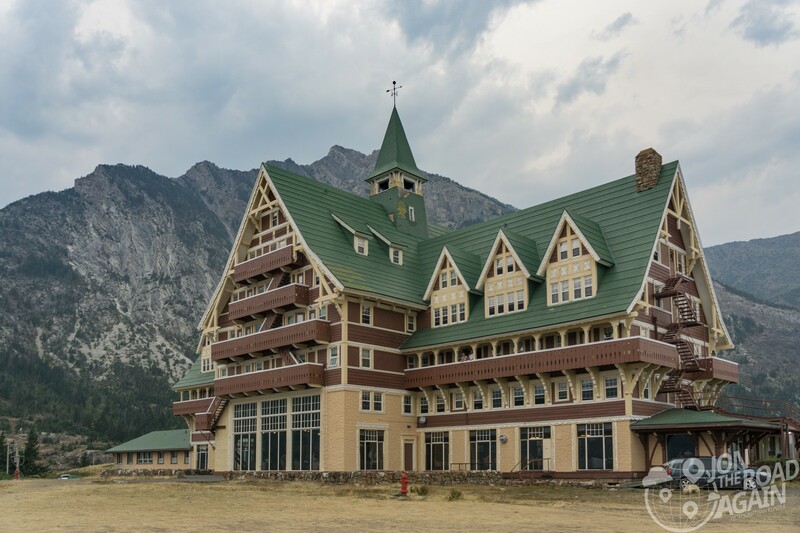 We’ve previously visited Many Glacier Hotel and Lake McDonald Lodge and now we visit the the northern most of the Great Northern Railway buildings in the Glacier/Waterton area. Your first look at the Prince of Wales Hotel is just after the park entrance. 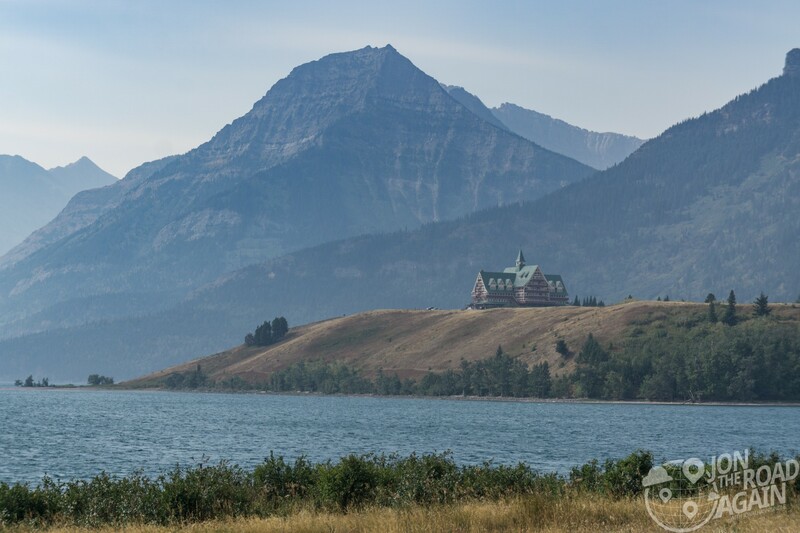 Pull off to the left just after the Waterton Lakes golf course for this long look at the hotel with a background of endlessly repeating peaks. 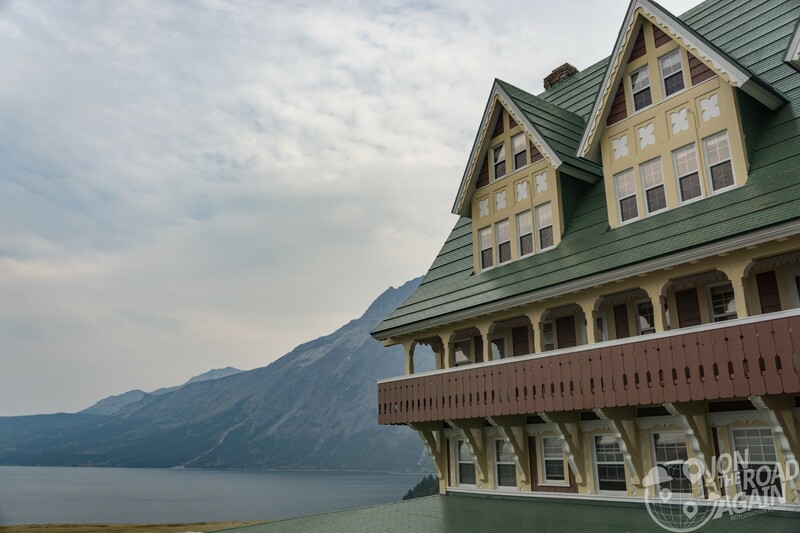 Plenty of other great views of the hotel are found from the Waterton townsite. 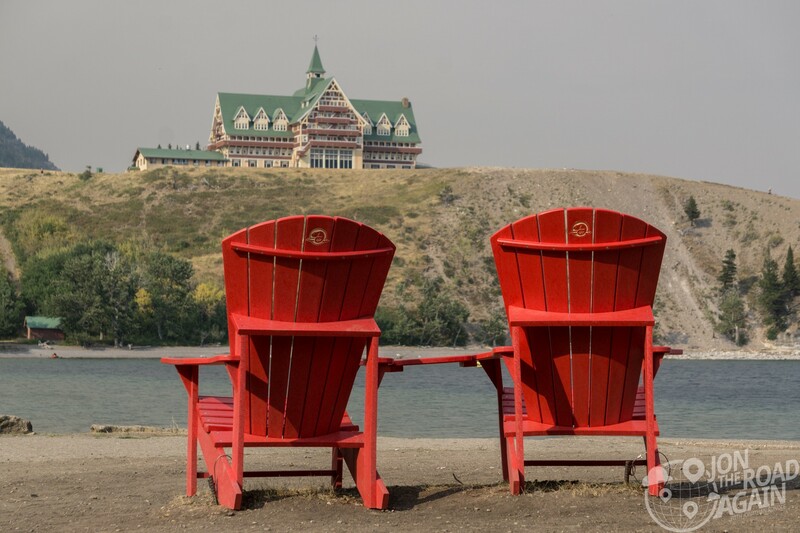 In fact Parks Canada has put these red chairs in some famously photogenic spots throughout the park, including at this view across Emerald Bay. The Great Northern Railway company built the hotel as a way to get around Prohibition in the United States. The United States didn’t end Prohibition until 1933 – Alberta voted to end it in 1924. Two years later, construction started on the Prince of Wales Hotel. The cost to build the hotel was $371,465.50. The Great Northern spent a further $300,000 on complementary facilities, including the 100-foot water tower, the powerhouse (including boilers and laundry), road construction, three staff dormitories, temporary construction buildings, engineering costs and hotel furnishings. 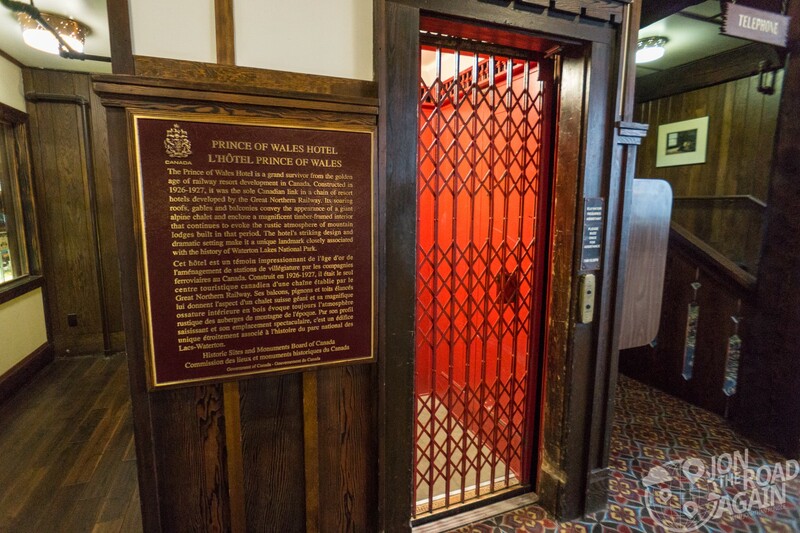 The hotel was named “Prince of Wales Hotel” in order to entice the future King Edward to visit the hotel during his summer of 1927 visit to Canada. It didn’t work, as the Prince decided to instead stay at his ranch a little farther north in Alberta. At seven stories tall (storeys for any Canadians out there) and presiding over the town, I find the Prince of Wales Hotel the most imposing of all the railway hotels. At 122 feet it was the tallest timber structure in Canada for quite awhile after it was built. 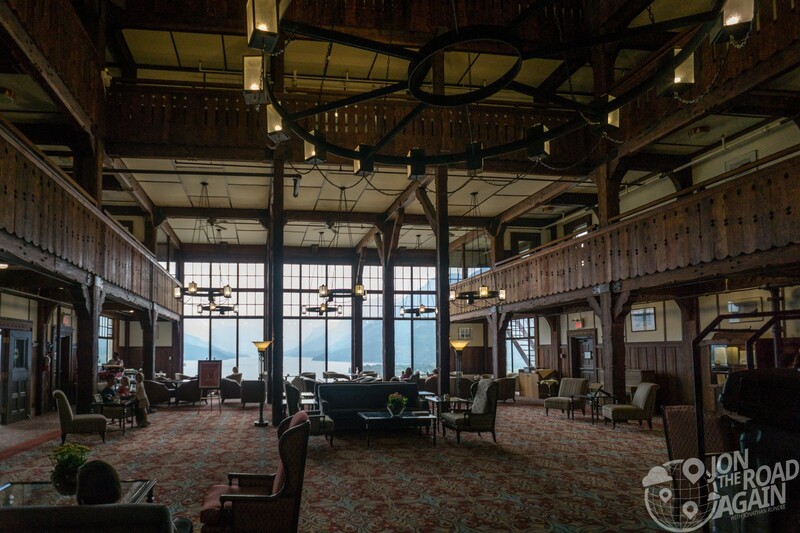 The hotel is built primarily of Douglas fir and cedar cut in the Pacific Northwest. It took 100 railway car loads of lumber to complete the job. 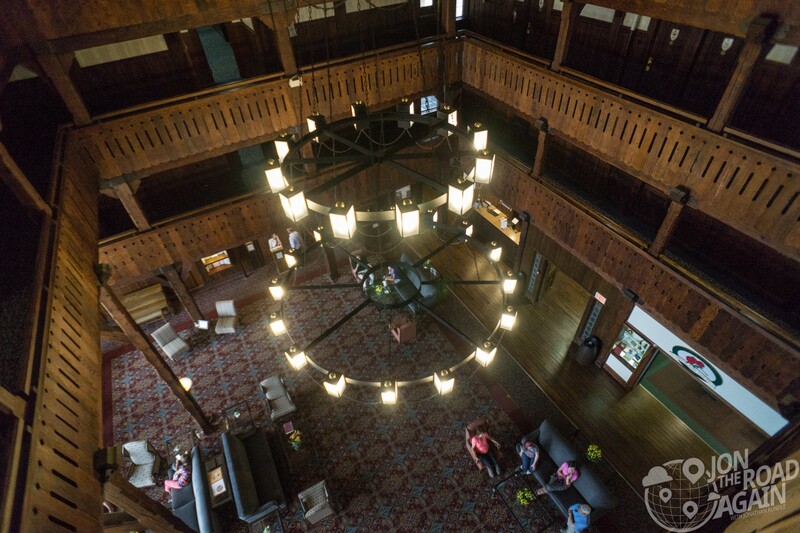 That wood construction is evident in the lobby – Swiss chalet style wood is everywhere. The hotel lobby is 54 feet wide and 82 feet long, from the outside north doors to the front windows. The centerpiece of the lobby are the three 12-foot wide by 18-foot high south-facing windows. 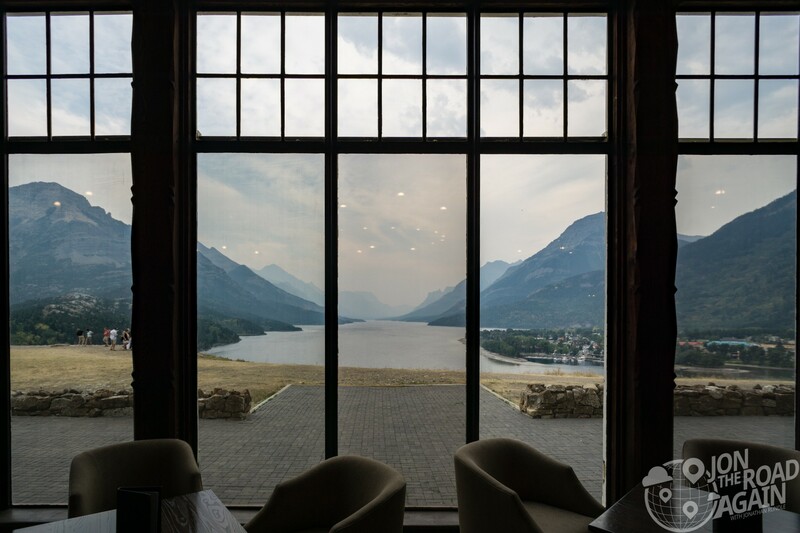 Soak in those amazing Waterton views from anywhere in the lobby. The east wing of the main floor holds the Windsor Lounge, the west wing holds the Royal Stewart Dining room. Be sure to come up to the hotel for afternoon tea. The lobby height is 61 feet from floor to ceiling. The lobby pillars are 13 inches square. Climbing to the fourth floor, I took a look to the floors below. The structure was so tall, a elevator was a necessity to accommodate visitors as high as the fourth floor. For those staying any higher, you have to climb the stairs to continue. The rooms on this level have access to the wrap-around porch and more of those amazing views. 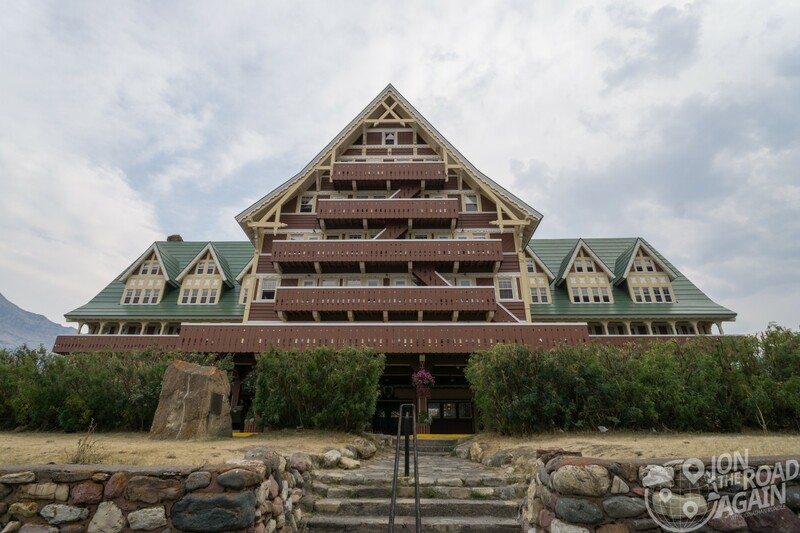 Outside, the hotel holds its own against the towering peaks of Mount Crandell, Mount Alderson and Mount Richards. 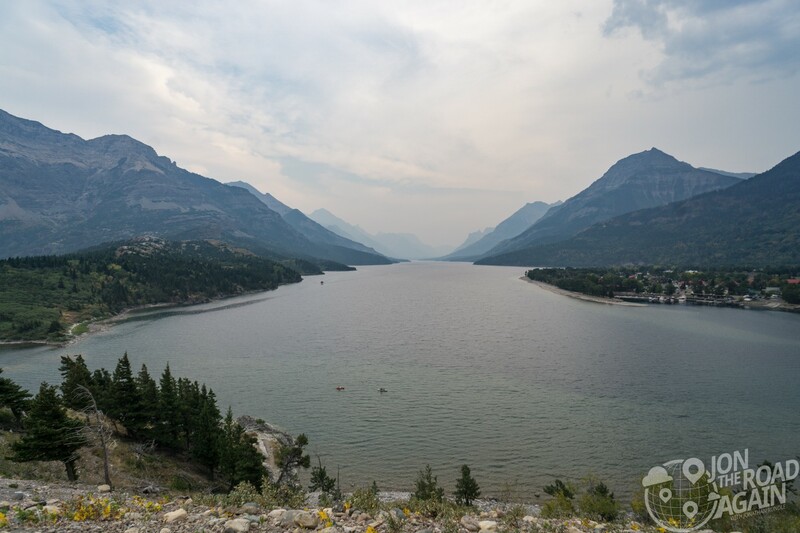 In the panorama below, the scene extends to the Waterton townsite and all the way through Upper Waterton Lake. The park was closed and the town was evacuated. 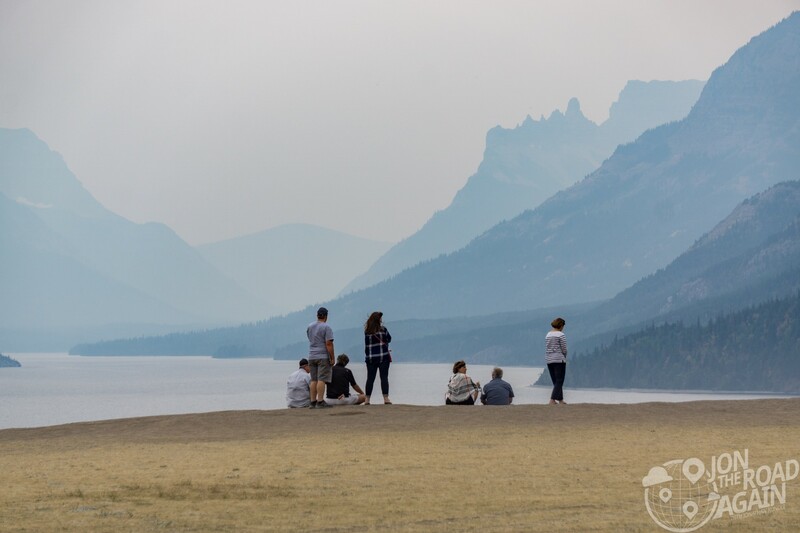 The Kenow fire burned 96,000 acres and burned Waterton Lake’s Visitor Centre to the ground. 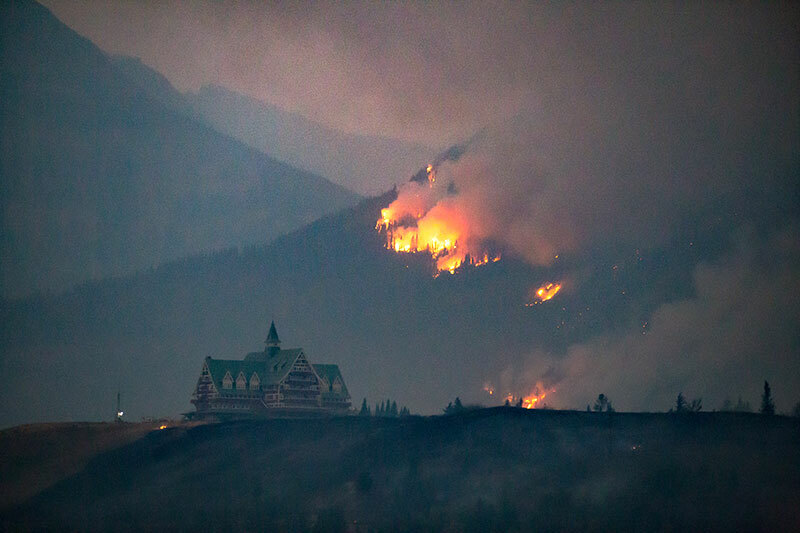 Through the hard work of park staff, firefighters, and a lot of luck, the townsite and this majestic hotel were spared. Things are much more peaceful here tonight. A calm before the storm. Visit the official website of the Prince of Wales Hotel to book your stay. Afternoon tea is every day from 1 – 5 pm.